Steve Knightley Live at Stanley Halls; we gotta gig! Yes, it’s true. You asked and we give, here is the first, professional music concert at Stanley Halls for goodness knows how many years. 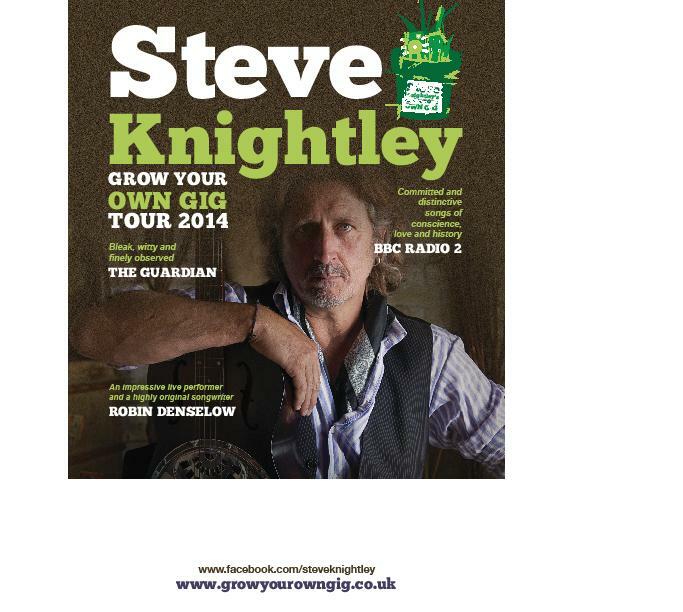 Steve Knightley, one half of prominent folk duo, Show of Hands, is doing a solo acoustic set in his Grow Your Own Gig tour. More used to frequenting venues such as the Royal Albert Hall, Steve wants this tour to be a bit more intimate, so where better than Stanley Halls? Find out more about Steve and the tour here. 8pm Wednesday 5th February at Stanley Halls, 12 South Norwood Hill, London SE25 6AB. Also, the bar will be open and beer will be from local brewer, Clarence and Frederick. Thanks to Khris for spotting the spare ‘a’ in the title. Getting so excited about having a gig that we can no longer construct a sentence, as proved here. This will make no sense to folk who come across this post whilst browsing and didn’t get the post via email (spelling aside, a good idea if you are interested in Stanley Halls, just enter your email in the prompt box and get the blog posts sent to you).